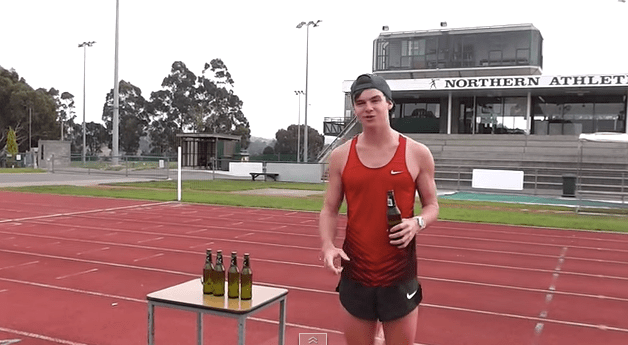 James “Jimbo” Hansen explains the Beer Mile ahead of his attempt to break the world record. “Chug a beer, run a lap. Chug a beer, run a lap. Chug a beer, run a lap,” says 21-year-old James “Jimbo” Hansen when explaining the rules before what appears to be his world-record-setting attempt to set a new ‘beer mile’ world record. While beer and running have been linked, well, probably since the invention of each – and new start-ups Craft Brew Races have launched – it’s no surprise that there is a world record for the Beer Mile. Yes, we’re making it a proper noun to show it some respect! BeerMile.com a site that tracks the 89,000-plus attempts at the record so this is obviously something people take seriously. BeerMile.com tracks more than 89,000 attempts at breaking the record. The Beer Mile record rested with James Nielsen of Novanto, California who set it at age 34. According to Runner’s World, Nielsen was a two-time NCAA champion in the 5,000 meters while attending the University of California San Diego, and, in 2007, he won the Eugene Marathon and qualified for the 2008 U.S. Olympic Trials, finishing 50th in New York. Note that BeerMile.com lists James Nielsen of Novanto, California as the world record holder with a time of 4:57. That’s because they haven’t yet reviewed (at the time we’re writing this) the attempt by Australia’s James “Jimbo” Hansen. According to Runner’s World, Jimbo posted a YouTube video (it’s below) showing that he bested Nielsen’s record. Jimbo’s video shows a time of 4:56.25. – Drink a beer that is at least 355 ml or 12 oz and 5% ABV before the start of each lap. – Beer must be consumed before the lap starts and within a 10 meter zone on the track. There’s a few more details that you can check out at the link above if interested. We’re off the the gym … or the bar … or maybe one then the other.